Pop up camping, while maybe slightly less primitive than tent camping, is still basically living outside with only a piece of heavy duty canvas between you and the wilderness. Let’s face it, our Freedom Machine is just a glorified tent on wheels with a door, a battery, and a propane tank. Yes, we have lights, a heater, a dorm-size fridge, and a 3 inch mattress, but there’s no toilet, so as far as I’m concerned, that equals roughing it, and it’s awesome! But anything we can do to make camp life a little easier and a little more “luxurious,” I’m all for it. Below is a list of the top 19 nonessential items that have become essentials for us on our pop up camping adventures. Second grill for outdoor cooking: The Freedom Machine has a two burner stove that can be moved from inside to outside fairly easily, but camp cooking is messy, and I prefer to have a dedicated outdoor cooking stove/grill. That way we can keep the inside stove clean and reserved for non-messy things like heating soup or boiling water for coffee. Collapsible Drip Coffee Maker and Collapsible Kettle: I love my Starbucks, but not only can we not afford it (at least not every day) on our sabbatical budget, 99% of the time, there won’t be one nearby. So I bought this collapsible java drip coffee cone at the suggestion of a camping friend/guru (Thanks, Chuck!) along with a collapsible kettle. The cone collapses down to about an inch thick disc. 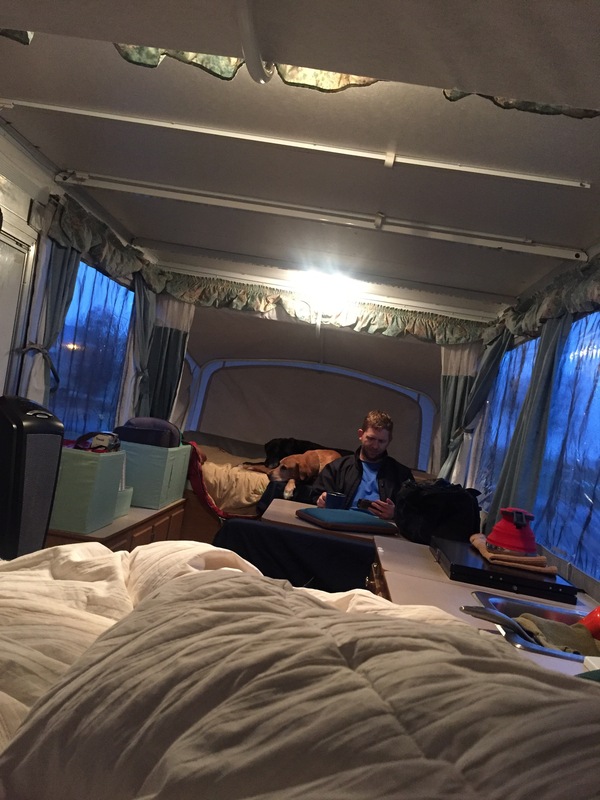 Mattress topper: The camper mattress is just a 3 inch piece of cheap foam covered in fabric, so we purchased a good eggshell mattress topper to lay on top and give us better support. So grateful that Trent insisted on this improvement! Flannel sheets and Comforters: Even in the summer, the nights can be cold where we’ll be camping, so flannel sheets are a comfy must. We could just throw some sleeping bags on top, but I really want it to feel more like “home,” so the comforter combined with the flannel sheets and pillows make it look and feel like a special retreat. Padded Camping Club Chair with Foot Rest (they called it an ottoman, but I just can’t go that far): I like to put my feet up, and I’m not going to apologize for that. And they make a padded camping club chair with matching foot rest as luck would have it… Can’t wait to snuggle up and read a book in this chair! Wireless speaker: Nature is quiet. Sometimes too quiet. Flip flops: It’s a lot easier to throw on flip flops for a middle of the night trip to the bathroom than hiking boots. And they’ll come in handy for those coin-operated showers! Easy to clean pans: Scrubbing dishes with only cold water at your disposal is hard. Easy to wipe out pans is critical and worth the expense. I use a small 6″ Scanpan. Inside/Outside Dog beds: Molly and Tucker are our four-legged furry kids, as many of you know by now, so we can’t leave them out! Everybody in the Tarkenton pack gets a comfy place to sleep and nap! Cards and games: We love playing games, and since life at the campsite can be slow anyway, having some games around is a win-win. Our favorites are card games and and iPad games because they are portable. Right now we are playing a lot of Alphabetty on the iPad. Ceramic heater: Again, comfort is key, and cold nights are no fun without plenty of heat. The camper heater is pretty good, but the ceramic heater has been a life saver when a little extra warmth is needed. This one is made by Lasko and was a gift from my wonderful husband. Tip: we flipped a circuit breaker when we first plugged it in (ok, we tried to run two at a time–it’s cold! ), so know where your circuit box is. Collapsible cubes and storage containers: These are for easy access things that we keep out on the counter or under the counters, but need to keep organized. they are a lifesaver when you are looking for your car keys, gloves, or hair clips. We use the bigger ones to organize our clothes and groceries. Crock pot and crock pot liners: When we are sick of the instant meals (soups and oatmeal), crock pot meals are a great option because it’s basically throw it in and let it cook all day. And easy clean up when we use the crock pot liners. Outdoor Shower: Trent bought this for me as a surprise, and although I haven’t tried it yet because our camping trips haven’t been long enough, I am looking forward to giving it a try this summer. It’s a simple, but clever device. The water in the bag heats up in the sun, creating a nice warm stream of water. And if coin operated showers and baby wipes are the alternative, this outdoor shower may just be my nirvana. Portable Gym: Since one of my priorities is to get in shape, and I don’t want to have to rely on running or hiking every single day (I get bored), I’ve invested in some portable gym equipment that doesn’t take up much space but will give me a lot of workout options. My mini gym includes: resistance bands, plyo loops, a slam ball, a yoga mat, suspension straps, a balance disc, 15 pound weights, a jump rope and a kettle bell. I may decide to leave behind the weights and kettle bell and get creative like Rocky instead. Rocks and logs anyone? More blogs to come on my campside workout regiment. I had planned to take some pics this weekend but it’s miserable weather. Good Sam Club membership: Some camping friends clued us in to this great deal. We get discounts at camping stores, some campsites, and fuel at Pilot Flying J. We also paid a little more for the roadside service. $80 per year for peace of mind is a steal! Without the roadside assistance, it’s only $27 per year! Now, some of you might say we might as well just stay home with all of these creature comforts, but we can’t cook breakfast outside while watching the sun rise over the mountains at home. We can’t lay in a hammock at home and listen to wild birds and bubbling streams as we fall asleep. We can’t go for a midday hike just by opening the front door and taking two steps. So, I think we will hold on to our self-made life of camping extravagances and six months on the road with the Freedom Machine for Part I of our year-long sabbatical. Related: Read all about our first pop up camping adventure at Cheyenne Mountain State Park! Your puffy window treatments look perfect: a touch of hominess with a minimum of fuss. Wish I could take credit for that but that’s how we bought it! If I could sew I’d make new ones! For 3.5 years after college, I worked at a therapeutic wilderness camp. I lived outside the whole time. It was the best starting job. Anyway, the crazy cold nights weren’t as mad when I got some hot hands and put them in my bed to warm it up before I got in. I then lined the sides of my burrito tucked bed with the next days clothes. More insulation and hot hands last for hours. And then the next days clothes are warm. Because cold clothes on a cold body is just on much before you wake up. Trent just bought some cool heated pads that activate with some magical sciencey thingamajiggy. I’ll be adding those to my essentials list. Wow! Love this prickly heat powder! Do you know if they sell it in Thailand too? Yes the sold it everywhere. That’s where I discovered it!